It’s late summer 1966 in a small town in upstate New York when the body of eight year old Michael Vogel is found at the bottom of the deep end of the municipal swimming pool four hours after closing. At first, the townspeople believe the initial reports that it was an accidental drowning, despite the fact that the boy’s body wasn’t discovered when the lifeguards searched the pool earlier in the day after his sister reported him missing. However, when an autopsy brings an unexpected result, it sets in motion a search for a killer, in a town unaccustomed to murder. The story is told from the perspective of three members of the community. One is a twelve year old boy with a future he wants to avoid. Another is a sheriff with a past he wants to forget. The third is a forty year old bachelor with a secret he wants desperately to keep. Their stories all come together in a startling and thrilling conclusion that leaves nearly as many questions as answers. A solidly written and intriguing murder/mystery novel set in a small town upstate New York. Yanno writes a chilling story of conspiracy, murder, secrets and childhood. This book has the voice of innocence, of burgeoning adolescent dreams, of discoveries of self and of life. I loved this voyage into 60’s small town America – a time of innocence, a town where murder is not the norm, where families know their neighbours; kids ride bikes and swim at the local pool, play football, watch fireworks displays. Kids have adventures and everyone knows everyone – or do they? This story is told from 3 perspectives and the voices tell the story well, give different point of views and provide useful background material. This is a story about murder but it is not about the detail of death, it is not about gore and blood splatter and forensic examination – it is a story about murder and people and the frailty of life. It is not a story that will keep you awake at night in fear of the unknown, of what maybe be lurking; it is a thought provoking, considered journey into complex lives. It is playfully teasing; Yanno slowly revealing one layer after another of this complex plot in a flawless strip tease that ultimately reveals the truth about the murder of Michael Vogel. 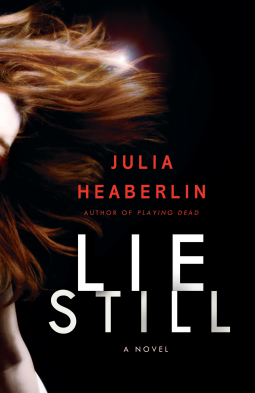 This is a book about secrets and lies. It about masks – about the different faces we show the world; one for our friends and intimate companions, one for the community, one for our family. Which mask are you wearing now? This was an exciting, fast paced read that kept me guessing until the final reveal. Heaberlin creates a strong, empathetic female protagonist and a cast of rich and entertaining minor female roles – the women of “The Club”. Secrets, allegiances, trust, are all themes that lace and entwine throughout this book, some secrets are so huge that carrying them around is a death sentence. The reader is engaged in a very cinematic view of the town, the inhabitants, and the characters. The prologue is beautifully descriptive and chillingly eerie. I can see the mountain, I can see forest floor. The image of the dirty, discoloured and scratched plastic child’s ring is ominous. It is an omen of decay and death; very visual, very engaging. The realm of secrets, trusts, conspiracies and blackmail are pared open for all to see. The dynamics of relationships are laid bared. This is a very well constructed mystery /thriller; with engaging characters, a taught narrative combined with elements of humour that make this a most satisfying and thought provoking read. I look forward to reading Heaberlin’s earlier book Playing Dead. Paul McCartney and John Lennon described him as the Beatles’ “favorite group,” he won Grammy awards, wrote and recorded hit songs, and yet no figure in popular music is as much of a paradox, or as underrated, as Harry Nilsson. In this first ever full-length biography, Alyn Shipton traces Nilsson’s life from his Brooklyn childhood to his Los Angeles adolescence and his gradual emergence as a uniquely talented singer-songwriter. With interviews from friends, family, and associates, and material drawn from an unfinished autobiography, Shipton probes beneath the enigma to discover the real Harry Nilsson. A major celebrity at a time when huge concerts and festivals were becoming the norm, Nilsson shunned live performance. His venue was the studio, his stage the dubbing booth, his greatest triumphs masterful examples of studio craft. He was a gifted composer of songs for a wide variety of performers, including the Ronettes, the Yardbirds, and the Monkees, yet Nilsson’s own biggest hits were almost all written by other songwriters. He won two Grammy awards, in 1969 for “Everybody’s Talkin'” (the theme song for Midnight Cowboy), and in 1972 for “Without You,” had two top ten singles, numerous album successes, and wrote a number of songs — “Coconut” and “Jump into the Fire,” to name just two — that still sound remarkably fresh and original today. He was once described by his producer Richard Perry as “the finest white male singer on the planet,” but near the end of his life, Nilsson’s career was marked by voice-damaging substance abuse and the infamous deaths of both Keith Moon and Mama Cass in his London flat. 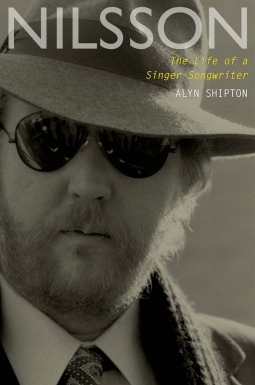 Drawing on exclusive access to Nilsson’s papers, Alyn Shipton’s biography offers readers an intimate portrait of a man who has seemed both famous and unknowable — until now. Let me preface my review with the statement – I am a big Harry Nilsson fan. And I thought I knew a lot about this musician, his music and his life. I have listened to and bought his music and have watched and enjoyed the documentary Who Is Harry Nilsson (And Why Is Everybody Talkin’ About Him?) but in reality I knew nothing about this complex paradox of a man who inspired and was inspired by the world and what it had to offer. Nilsson produced so many more albums than I was aware of, he made movies, he acted, he wrote jingles for commercials, he wrote sound tracks for movies, he wrote musicals, he wrote kids books, he was a singer and a songwriter – he was prolific in output and somewhat manic in his behaviour. Nilsson worked hard and played even harder. It took me a little while to get into this book – I was not aware of Harry’s childhood or upbringing, in fact I hardly knew Harry existed before “One ( Is the loneliest number)” or “Jump into the Fire” or “Without You”. There was so much more to Harry than I had glimpsed on the popular music charts. There a library of music out there that I must discover and Shipton has opened my eyes and ears to it! I was not aware of the influence and relationship Harry had with so many well known and respected artists – this is a side of Harry that was unknown to me. Once I started reading about times and song material that I was familiar with I was mesmerised by this story of the good time boy who partied and partied and wanted work to be fun! (Dont we all wish that?) Harry wished it and Harry lived it- to excess. Even though I was very aware before I picked up this book that Harry Nilsson was dead I still felt saddened when his demise was revealed on these pages. Harry Nilsson was by all accounts a likable rogue, an entrepreneur, an intelligent artiste who could see and work “outside of the box” and when you look at the body of work that was his life time achievements, the depth of his talent cannot be ignored. He was a truly gifted narrator of the journey of life; his words and music moving, passionate or funny, ironic, sad, entertaining and his observations of life poignant. I very much enjoyed delving into the life and times of Harry Nilsson and I look forward to re discovering his talent from his beginnings to his classic hits. 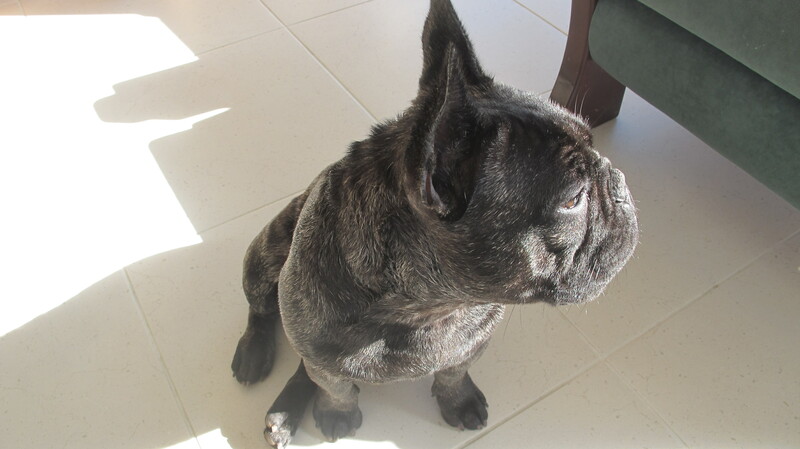 Last week we were tasked with dog/house sitting in Mandurah WA whilst my sister went East to watch her son participate in a national baking competition. The days were glorious – the nights – cold; typical autumn weather. 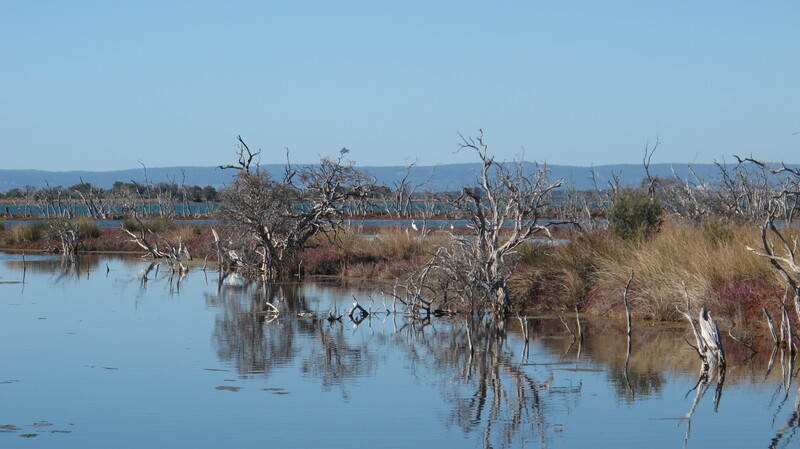 I really enjoyed the local walks around the numerous parks and the marina and in particular the wetland walks in the Len Howard Conservation Park. Local park on a beautiful autumn day. 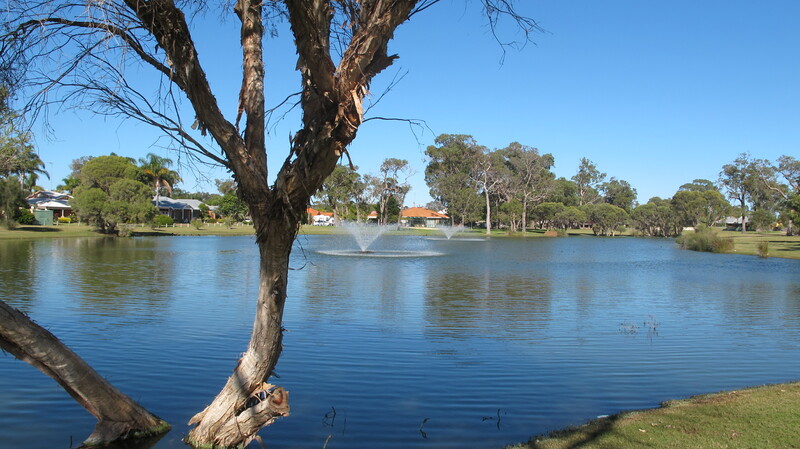 This week we are house and dog sitting in Mandurah – a coastal town about an hour from Perth, WA. 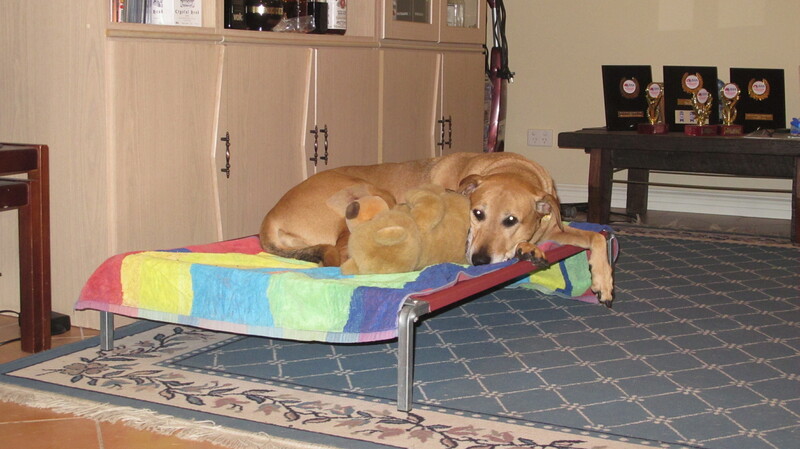 This is Star Dog – cuddled up with her teddy. She has been enjoying our company and loving the walks we have taken the dogs on each day. Yesterday we took Dempsey back to his home. Our house is so quiet now.